You can see from my 4Q portfolio update that I have been buying shares of Blackstone (BX). I first bought some shares in the third quarter last year – bought again in the fourth quarter – and my last purchase was in January. Blackstone is a somewhat unusual public company. It is a partnership – not a corporation like the majority of U.S. public companies. It has a $40B market cap and yet it is not part of any well-known market index like the S&P 500. You might not even be able to buy its shares in your IRA or 401(K) – depending on your account custodian. Because Blackstone is a partnership (LP), any income it generates is passed through to its shareholders. Technically, they are unitholders, not shareholders. As a unitholder, the income I receive (in form of dividends) is treated as ordinary income and not as qualified dividends. This is as if I am a partner in that business – which I truly am in the eyes of the law. If you ever had been a partner in an LLC or LP, you will know how to handle Blackstone dividends. Buying LP shares in an IRA or a 401(K) account is tricky. Many account custodians don’t allow it. If you are able to invest at all, income you receive may not be tax protected because of UBIT (Unrelated Business Income Tax) rules. I only buy BX shares in my taxable brokerage account. Partnerships like Blackstone are not governed by the same rules that apply to C corporations. Unit-holders don’t have as much say in how the partnership is run or how the company’s board is formed. We as unitholders are considered passive investors in the partnership. It is the general partner (controlled by the BX directors) that makes all the business decisions. But before I turn you off this investment completely, consider this. These constraints are also what makes Blackstone an interesting opportunity today. Its business prospects are under-appreciated by the market. It is not a widely followed or owned stock due to the reasons mentioned before. Fewer analysts follow its business than other similar sized public companies. Best of the breed. BX is an alternate asset manager (AAM) – the biggest of its kind based on assets under management (AUM). It is also the most diversified asset manager with multiple asset types. It has also been among the most innovative to introduce new investment categories to its clients: infrastructure, insurance, and early stage growth equity funds to name three. It has the best reputation among institutional investors – as evidenced by consistent AUM growth over the years. Even during the 2008 financial crisis, BX grew its AUM year over year. Since its IPO, its AUM has quadrupled – amounting to about 15% annual growth. What is an alternate investment? An alternative investment is an asset that is not one of the conventional investment types, such as stocks, bonds and cash. Most alternative investment assets are held by institutional investors or accredited, high-net-worth individuals because of the complex natures and limited regulations of the investments. Alternative investments include private equity, hedge funds, managed futures, real estate, commodities and derivatives contracts. Blackstone is a leading global alternative asset manager, with Total Assets Under Management of $366.6 billion as of December 31, 2016. As stewards of public funds, we look to drive outstanding results for our investors and clients by deploying capital and ideas to help businesses succeed and grow. Our alternative asset management businesses include investment vehicles focused on private equity, real estate, hedge fund solutions, non-investment grade credit, secondary private equity funds of funds and multi-asset class strategies. As of December 2017, its AUM has increased 18% to $434.1B. Quality of management. This, in my opinion, is its most important advantage. Not only that it is a founder-run business, its founder CEO, Stephen Schwarzman, and its COO, Tony James, are well-known leaders in the industry. Schwarzman founded the company in 1985 and still owns more than 20% of the business. James is a long-time (since 1988) director of Costco, another company that I greatly admire. He’s been with BX since 2002. I liked it that Schwarzman who is staunchly Republican, hired James who is a well-known Democrat. It tells me that the management is open-minded. The two seem to work well together – cognitive dissonance can be a good thing after all! Executive compensation is almost entirely based on how well each of Blackstone’s asset funds perform. Both CEO and COO base salaries are fixed at $350K. The rest of their income depends on performance fees generated by the company. Since the common unitholders are also paid dividends from the same funds, we and the management have shared financial interests. I trust Blackstone senior management. They’ve been around for a while. Their reputation and money are both tied to the company’s future. Trades at a good discount to the market. This is a business that distributes most of its earned cash in form of dividends. Management targets about 85% of distributable earnings for dividends. However, the nature of the business is such that its earnings tend to be volatile. 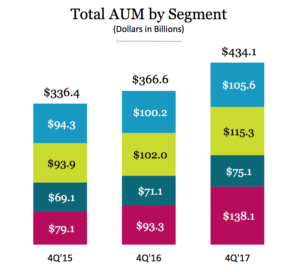 About one-third of earnings are from AUM management and the rest from asset gains. These asset gains are not consistent every year. Some years BX sells more assets when the market offers good prices for them. Other years such realizations may be fewer. For valuation, I focus on their dividend generation and average them over three years since year-over-year changes are volatile. In December, their current dividend yield was about 7%. But if I take their average 3-year dividend of $2.50 per share, expected yield was 8%. Over last 8 years, its dividend yield has ranged from 3% to 10% – so currently it is near its all-time high. They have been growing AUM by about 10-12% so I expect dividends will also go up at roughly the same rate. Even if yearly dividend increase slows down to 6% over next 3-5 years, my expected return would still be 12 – 14% annualized. Icing on the cake? With the recent passage of Tax Cuts and Jobs Act (TCJA), could they convert from LP to a C corporation? If this were to happen, its stock will instantly become accessible to the much larger investment community – very likely increasing its valuation multiple as a result. On the other hand, earnings will be impacted by about 15% (CEO estimate) due to additional corporate tax. 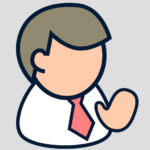 Management stated in the 4Q conference call that they are still studying the benefits of conversion. I am gradually building my stake in Blackstone. The more I study the company and its management, the more I like it. Private Equity guys often get bad rep from investors. But I like how this company is run and its long-term prospects. I don’t expect it to be a super compounding engine (like Amazon and Facebook, for example). Its market opportunity is not nearly as vast. Neither can it reinvest its earnings into many other high growth areas. On the flip side though, it can generate good income for me that I can then reinvest elsewhere. This investment is clearly for its post-tax income generation potential – not long term tax-free compounding. If you’ve been reading my blog, you’d know that I like stocks that could someday turn into perpetual bonds – like my Starbucks purchase.